Student performed different plays and tableaus focusing on disaster management. 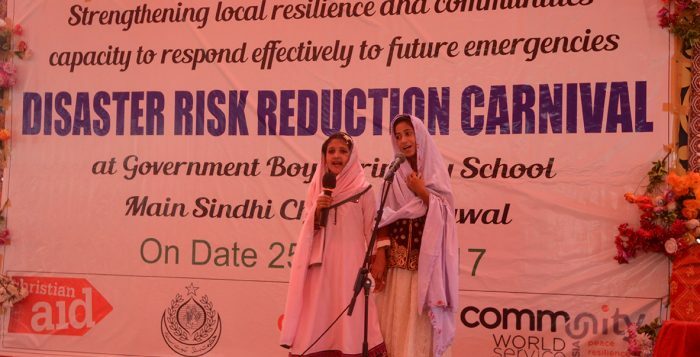 Iffat Mehmood Khattati, a student of Class 4, from GBPS Main Sindhi Chandia, Sujawal reciting Surah Feel at the DRR event. Khud Bux Behrani, Deputy Director Social Welfare Thatta, expressed his positive views in relation to the DRR trainings and exercises conducted in schools. Students from GBPS Main Sindhi Chandia dressed-up for their tableaus. 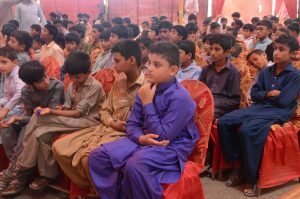 Students from various schools in Sujawal attended the important event. Participants including students, teachers, government officials and various stakeholders appreciated the educative event. Guests visiting the models of the Mobile Knowledge Resource Center (MKRC). 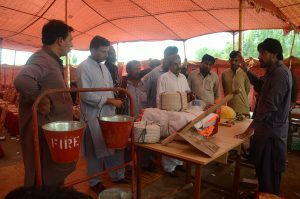 Hafeez explaining the use of different equipment at times of disasters including earthquakes, fire and floods. Paintings of students on display focusing on disaster management. Children are change agents and providing them with training to enhance their knowledge and skills is essential to help them grow and develop. Similarly, children living in disaster prone areas, need to be trained on disaster risk reduction (DRR) methods to make them resilient towards the adverse impact of disasters. Frequent occurrence of onset disasters make children vulnerable as they are adversely affected and their lives disturbed. In such situations a lack of DRR awareness makes things even worse. Under Community World Service Asia’s project, supported by Christian Aid in Thatta, collaboration is done with schools to develop a platform for young children to enhance their knowledge and skills on DRR through various trainings and activities, making them more resilient to future disasters. The Sendai Framework for Disaster Risk Reduction highlighted the importance of education and public awareness being critical in promoting a culture of resilience at all levels. Furthermore, commitments were made at the second session of Global Platform for DRR (2009) to provide safer schools by including DRR in all school curricula. 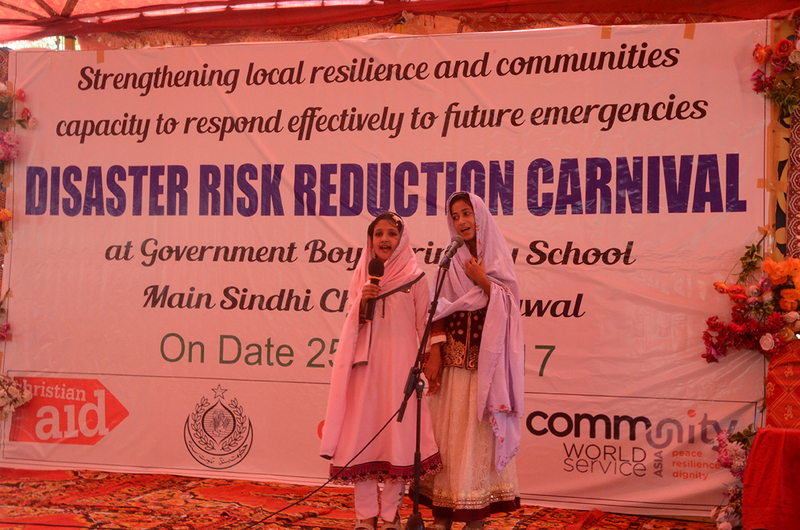 Considering the importance of public awareness, a DRR Carnival, organized at the Government Boys Public School (GPPS) in Main Sindhi Chandia, Sujawal, was organized to provide an opportunity to young children to present their DRR work. A Mobile Knowledge & Resource Center (MKRC) truck and DRR models were displayed at the exhibit, with brief sessions on simulation models carried out live. The main purpose of the event, celebrated on 25th May, 2017, was to engage teachers and students from different schools to hear about their experiences; how they implemented DRR in their schools and how it contributed to making their schools safer. 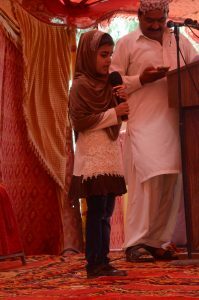 A student of class 4, Iffat Mehmood Khattati, opened the event by the recitation of the Holy Quran with Sindhi translation. She recited Surah Feeal, a surah focused on disaster. Students of GBPS Main Sindhi Chandia performed a welcome tableau for the guests, teachers and students at the event. 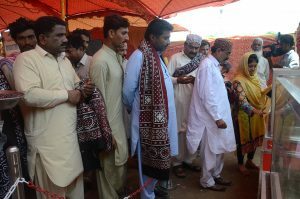 The play was focused on a Sindhi Legend singer, late Jala Chandio. 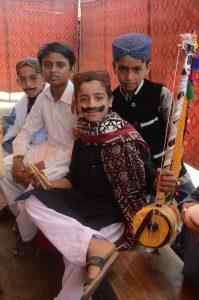 The purpose of the performance was to pay respect and honor to the Sindhi Traditions. 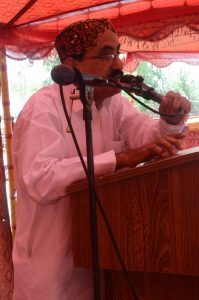 After the students’ performance, Naseem Khuskh, a teacher at one of the schools, recalled the tragic memories of the Kashmir Earthquake (2005) in which the death rate of children was very high. 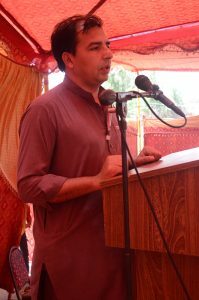 taking the opportunity to share information at a public platform, Muhammad Hanif Walhro, President LSO Kheeral, talked about the initiative of LSOs taken in the context of DRR. He added that volunteers from the communities have been trained on rescue and response for future disasters. 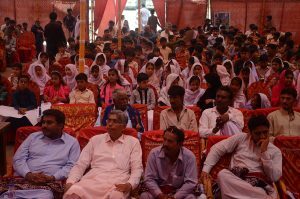 A total of five hundred guests, including students and teachers from various schools, government officials and other stakeholders, actively participated at the event. Two display stalls were set up which exhibited different equipment used at times of various disasters. 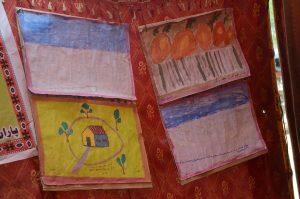 DRR themed paintings made by students of GBPS Main Sindhi Chandia, Sujawal were also on display. Guests at the carnival were also shown the Mobile Knowledge & Resource Center (MKRC) and were oriented on the different kinds of disasters and the effects they leave behind in communities.